I don't know about 2012 (we are on 2009) but you can easily setup a domain with access to just the company that you want the user to be able to access & then copy the user group into that domain. 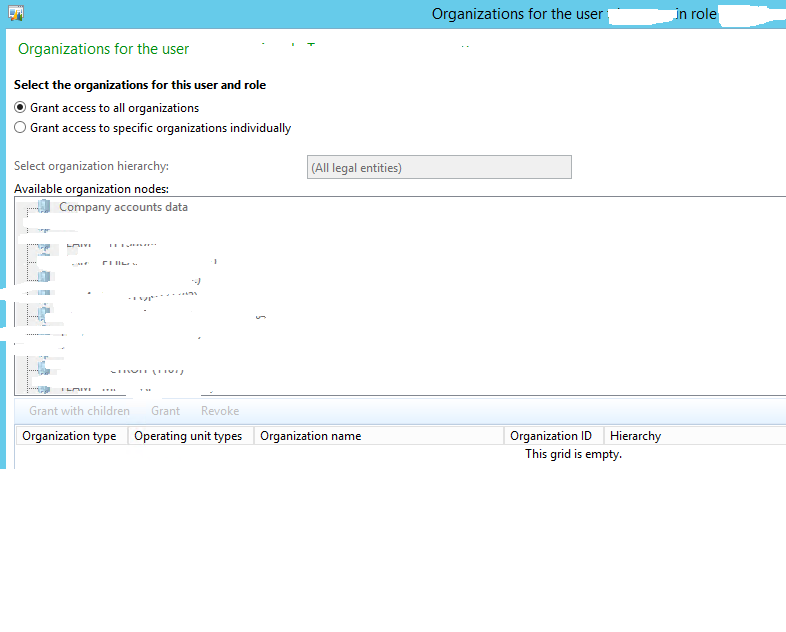 This way all users with that user group will only be able to access the company specified in the domain. 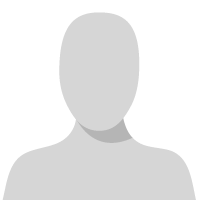 When assigning a role to a user, you can select if that role applies to ALL companies, or just to specific company/companies. Good to hear from you after we have met at the summit. I actually was asking if there is an automated way to fix this after the fact that a mass amount of users been already imported in the system with the ability to access to all companies. I don't want to go through each one and change the "organization assignment" for each role for each user. This would take me forever. I used Org Hierarchies, User Groups, and Automatic Role Assignment to achieve what you are looking to do. I first setup an Org Hierarchy for Security. 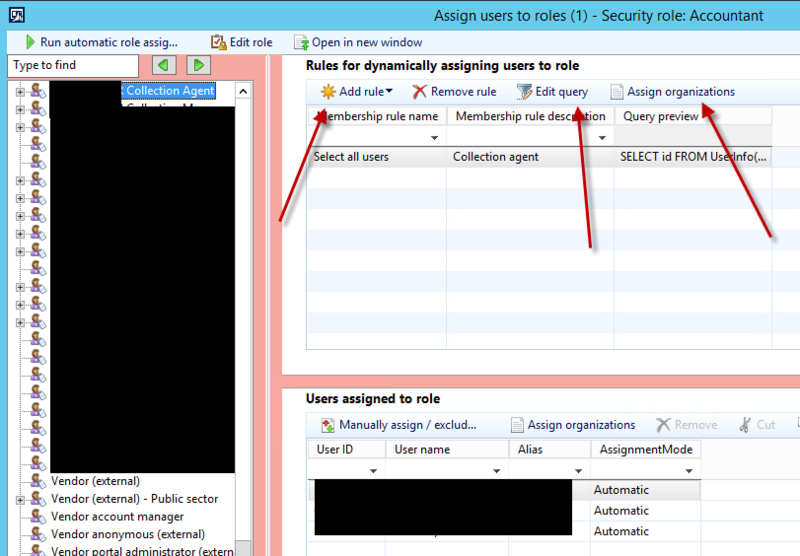 Then setup User Groups per Role and Org Hierarchy/Company combinations. 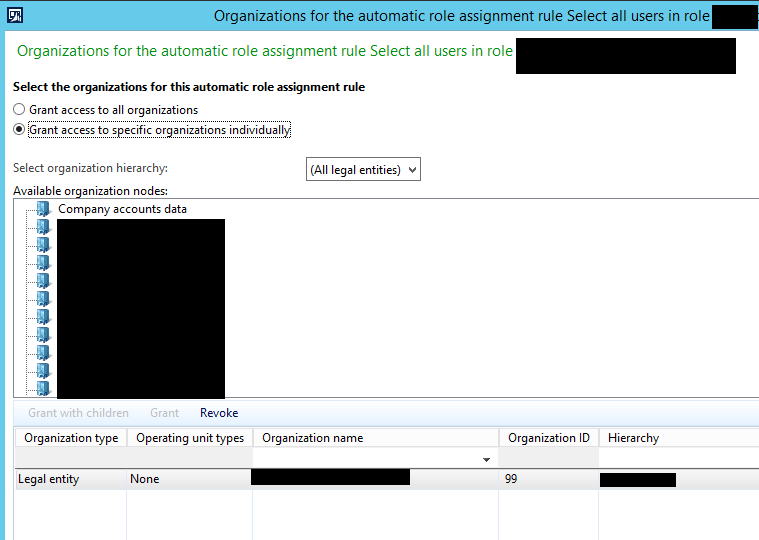 Finally, I setup a Batch Job to run the automatic role assignment. All I have to do is maintain the users to User Groups and wait for the batch job to run! I am exploring a shift from the above to an Active Directory Group concept. 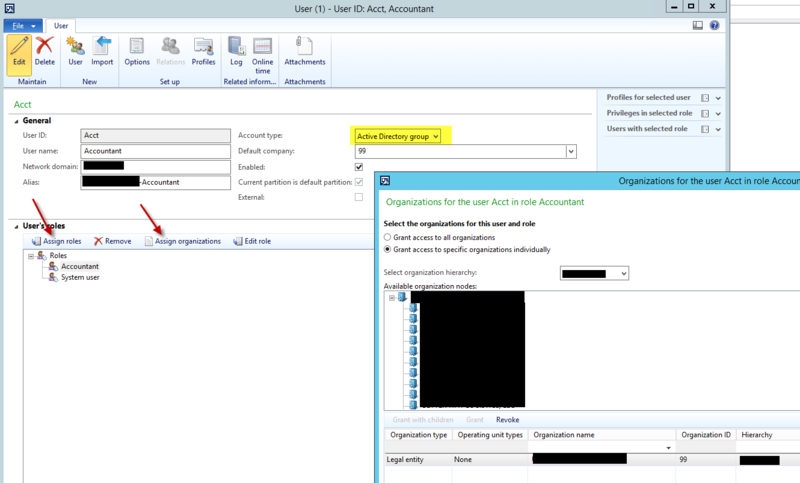 With this, I will create AD groups, AX Users with Account Type = Active Directory Group, assign the role, and assign the org hierarchy for each role and organization combo I need. This would eliminate the need to use User Groups, rules, and automatic assignments. AX security is now as simple as maintaining AD groups! Thanks for taking time to share screens. I will try the steps your provided. How to make the Grant access for specific organisation individually. Is there a way to create a rule by adding a legal entity data source in a query . If you have multiple legal entities and you want to create rules for giving access to a certain legal entity, you can actually follow the procedure as described above and create multiple rules for the same security role.